“Adopt” an African elephant calf and help support the conservation efforts of the World Wildlife Fund. The recipient of this gift will receive a plush elephant, an adoption gift certificate, a gift bag and more! All for just $55 USD. Give the gift of Rescue Chocolate and 100% of the net profits are donated to animals rescues. There are 10 different flavors, all are vegan and contain fair trade, organic ingredients. For 2017, the recipient of the net proceeds is Foster Dogs, Inc. Single bars are $6 USD. For the tea lover! At Design A Tea you can support a variety of animal rescues, while creating your own tasty tea blend. Choose from a variety of tea bases (oolong, black, green, roobios) and add up to 2 flavors. Prices start at $4.95 USD. Everyone needs a new calendar. Why not start the year off right, with a Sochi Dog Rescue Calendar, for $16.87 CAD. Each month features photos of adorable animals who have been helped by the rescue. 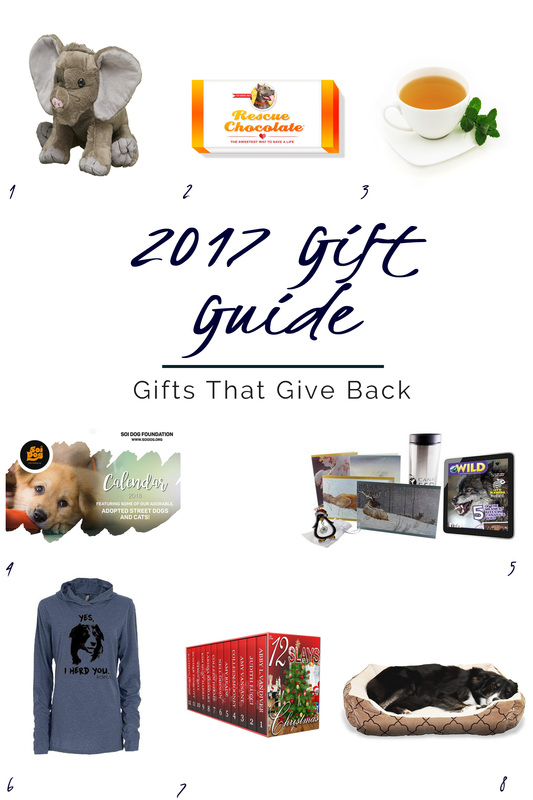 The Toronto Human Society rescues thousands of animals each year and with a $25 CAD donation, you can give a rescue dog the gift of a cozy blanket, bed and toys. They have gifting options for cat and small animal lovers as well. The BC SPCA has a fun collection of clothing for animal lovers such as this collie themed long sleeve shirt. Only $31.25 CAD. For the avid reader, this virtual boxed set of 12 cozy mysteries is sure to please. Available in all e-reader formats, this collection features the work of Kathryn Dionne, Colleen Mooney, Nell Goddin, and more! 100% of the proceeds will be donated to rescue shelters. Just $.99 USD or $1.32 CAD. This holiday collection features a digital magazine subscription, ornament, travel mug, and 4 blank Robert Bateman cards. All of the proceeds support the Canadian Wildlife Federation, $39.95 CAD.